SIGÜENZA itself is one of the main reasons to study with us, and its identity is central to our philosophy: Segontia was the town's name during its Roman period. In Latin, 'Segontiae' means 'in Sigüenza' or 'from Sigüenza'. Sigüenza's history goes back a long way. It was settled by the Celtiberians before taking on great importance during the Roman conquest due to its proximity to the road joining the Roman capitals of Emerita Augusta (now Mérida) and Caesar Augusta (now Zaragoza). The route crosses the mountainous region at the centre of Spain, and is even now a significant means of transport. Sigüenza was latterly both Visigothic and Muslim, before, in 1123, finally being conquered by Bernardo de Agén, the first Segontian bishop after the moorish, and becoming a part of what was the Castilian Kingdom. Sigüenza became a diocese seat, maintaining its regional importance by means of its strategic location; its historical significance was promoted by the aristocratic and religious establishment's construction of magnificent buildings and monuments. The town's cathedral is a peculiar and exceptional example of European architecture during the Middle Ages with its fortress-like style, due to its original Bishop's taste for war. The town is dominated by an imposing castle, situated at Sigüenza's highest point and formerly both an Arabic citadel and a Bishop's fortress. Nowadays, it's one of the most beautiful hotels of the Paradores Nacionales de España chain. The medieval town was surrounded by three different defensive walls, remaining today some pieces of them and their doors. La Plaza Mayor, the town's central square, is surrounded by a series of arcs, and, with the cathedral at one side, is considered to be one of the most beautiful and peaceful in Spain. A statue of the reposing El Doncel can be found inside the cathedral, a Renaissance masterpiece and Sigüenza's emblem. Narrow streets dating back to the Middle Ages can be found in the town's upper districts, having plenty of wonderful squares where you can sit, enjoy a beer, and let your imagination wander. In this part of the town there are several Romanesque churches and many other important buildings belonging to the former aristocracy. In the historic town's newer quarters, located further downtown, you can find wider and brighter urban spaces, as in San Roque, a quarter built during the Enlightenment period. Closeby, you can find relaxation in the historical La Alameda park, where the people of Sigüenza pass the time holding forth in their perfect Spanish. 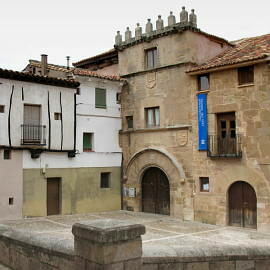 Nowadays, Sigüenza is both a historical and a modern town, where life passes quietly and peacefully. The town is well known for the high standard of life, far from the noisy and crowded big cities, but at the same time provided with all the important services, such as a hospital, schools, free time and cultural activities, telecommunications, means of transport, shops, etc. Sigüenza is a famous summer holiday town, specially for the people of Madrid. Sigüenza's population is small, with only 5000 inhabitants, and its people are known for their friendliness, always ready to stop and chat either in the street or over tapas in any of the town's numerous bars. This friendliness helps to create an excellent learning environment, in which you'll never be short of opportunities to meet new people and practise your Spanish. The town is also extremely safe, and a popular tourist destination for the people of Spain, with many hotels and two tourist information offices. Finally, it's important to note the town's historical status as a university city, it being occupied nowadays by the University of Alcalá de Henares. One of Spain's first universities was situated in Sigüenza, this being mentioned in El Quixote and Cervantes' other works. A university spirit is still very much central to the town's ethos, and our school finds its inspiration in this philosophy. Sigüenza is not just a town. Its municipal area has 400 km2 with little nice villages surrounded by nature and landscapes, which have not been altered by time. Most of these villages keep the ancient flavour of old rural castillian environment, with the stone houses and the red tiles surrounded by mediterranean forests and farming countries. Many of them have their own important architectural heritage, such as Palazuelos, which due to its surrounding wall and crowning castle is known as the 'little Ávila', Carabias, with its magnificent Romanesque church, and Guijosa and La Riba, with their spectacular castles. We should also note Imón, with its unusual saltmines that date back to the Roman period. We have three wide protected nature spaces close to Sigüenza. Río Dulce and Río Salado are the most important. 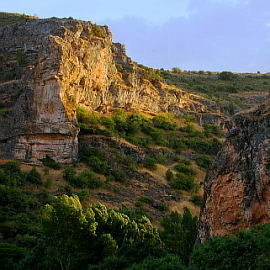 They have amazing limestone gorges, fluvial landscapes and mediterranean forest. Different species of eagles, vultures, birds, falcons delight the ocasional ornithologist, who visits this places. The forest fauna like wild boars, roe deers, genets and foxes are easily seen in the big forest grounds. Sigüenza's surrounding areas allow for many activities, such as walking, cycling, horse-riding, or just driving to visit the little villages around. Other beautiful towns of note nearby include Atienza, Medinaceli, Molina de Aragón, etc., not to mention further natural areas such as el Alto Tajo and la Sierra de Ayllón. 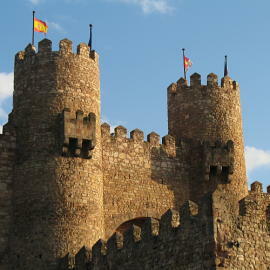 Sigüenza, in Castile, Cervantes' linguistic homeland, is located at the centre of the Iberian Peninsula. Many Spanish cities are within reach for day or weekend excursions, with Madrid only 130 km, or less than an hour and a half by train, away, and Toledo, Ávila, Salamanca, Cuenca, Soria, Segovia and Zaragoza all easily accessible. Sigüenza's proximity to Madrid grants access to longer-distance modes of transport, with the city's airport and high-speed rail system (AVE) meaning any area of Spain is only a few hours away. The journey is 130 km, and will take about 1 hour and 15 minutes. Take the A-2/E-90 (Autovía de Aragón) and get off at exit 104. Sigüenza is a further 20 km. From airport Madrid-Barajas: See route (Google). Cars can be rented at the airport. Trains leave from Chamartín station in Madrid. Timetables are available at: link to schedules (more info: www.renfe.es).